The DA’s motion of no confidence in Gauteng Premier David Makhura, to be debated on Tuesday, is a precursor to the party’s efforts to win the province in 2019. It’s an uphill battle for the opposition. Gauteng Premier David Makhura will carry the burden of the Life Esidimeni tragedy throughout his career. At least 144 psychiatric patients died after the provincial government moved them to ill-equipped, unregistered and under-resourced NGOs. Dozens are still missing. The DA will lead a motion of no confidence in the Gauteng legislature against the premier on Tuesday, arguing that he should be removed as he was ultimately responsible. “He has to take full responsibility for what happened. You know, the massacres at Marikana and Sharpeville put together is less than the 144 people who have died under his watch,” said provincial DA leader John Moodey on Monday. The motion will fail. The ANC has a clear majority in Gauteng, where the party is relatively united, and its members have no grievances against Makhura significant enough for them to vote with the opposition. Knowing the motion has no chance to succeed, the DA wants to keep applying the pressure on the ANC while being seen to fulfil its responsibilities as the official opposition. The debate could also puts Makhura’s allies in a tight corner, having to defend their leader while not justifying what was effectively a massacre of vulnerable citizens. In Gauteng, the grand prize is not who serves as premier on Tuesday but control of the country’s economic powerhouse and most populated province. The DA is determined to govern Gauteng after the 2019 elections and Life Esidimeni is one of the reasons it thinks voters should reject the governing party. “This is the battleground for the future of our country. What happens in this province in next year’s election will reverberate throughout South Africa. 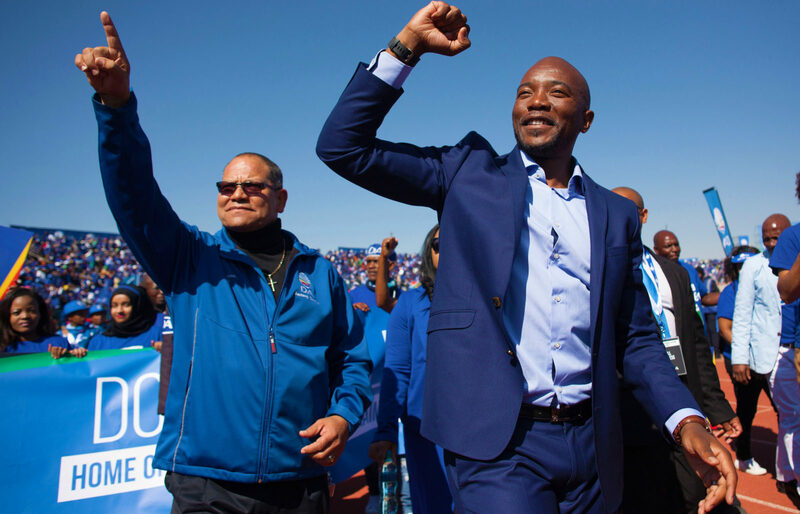 The tide is turning in Gauteng,” DA leader Mmusi Maimane said at the opening of the party’s recent congress in Tshwane. Moodey told Daily Maverick the DA hopes to take an outright majority in Gauteng in 2019, requiring almost 1.6 million additional votes. Voters are tired of the ANC’s empty promises and their plight hasn’t improved, he said, identifying unemployment, crime and education as the key issues for 2019. The ANC’s provincial vote dropped almost 10 percentage points between 2009 and 2014 to 54.92% and fell under 50% in the province’s metros in 2016. Even to form a coalition government, the DA would have to improve significantly on its 2014 result of 30.78%. Moodey believes voters have “politically matured”. He said the DA couldn’t campaign in certain areas to speak to voters 10 years ago, let alone win their support. That’s changed and the party now believes it can unite South Africans who have lost faith in the ANC behind the DA’s vision. The provincial leader dismissed the ANC’s chances of revival under President Cyril Ramaphosa, who has taken action against some of former president Jacob Zuma’s allies and committed to tackling corruption and building the economy. “We’ve already seen a sinking of that hope, of ‘Ramaphoria’,” said Moodey, claiming the leader might have changed but the core of the ANC has not. The ruling party disagrees and political analysts see Ramaphosa, combined with the DA’s internal challenges, as a threat to the party’s chances of growing in 2019. ANC Gauteng spokesperson Motalatale Modiba dismissed the DA’s motion of no confidence. Makhura has denied he knew about the plan to move Life Esidimeni patients early enough to save them and when the first deaths were reported he and the health minister had the health ombudsman investigate. Former Health MEC Qedani Mahlangu resigned and Makhura admitted the government was at fault. He had adhered to the health ombudsman’s recommendations and those of the Life Esidimeni arbitration, said Modiba. Neither the ombudsman nor the arbitration blamed him personally. Modiba said the DA is in disarray and was attacking the premier on Life Esidimeni because it couldn’t find fault anywhere else. Speaking recently after a provincial executive committee meeting, ANC Gauteng leaders spoke of Ramaphosa’s “New Dawn” and committed to improved governance. “There is no turning back to an era where ANC leaders became an embarrassment to the organisation, its supporters and the people of South Africa,” they said. Political analyst Daniel Silke said the 2019 campaign would probably be defined by the performances of Ramaphosa and DA leader Mmusi Maimane, with the EFF’s Julius Malema also likely to have a strong influence. He said the DA will need to deliver short and sharp messages for voters as it comes under increased attack by both the ANC and EFF. Silke said the DA needs to be more aggressive and avoid letting other parties set its agenda, lest the party stagnate at the polls. The party’s chances also depend on the ANC and whether Ramaphosa can tackle Zuma’s legacy. “Will the ANC limp along to the elections or will it hold its head up high?” asked Silke. The DA’s priority, he continued, should be improving its relationship with the press. Silke believes the DA has been vilified in the media and if it does not improve its communication strategy, its message will not reach voters. Professor Somadoda Fikeni said the DA has a “very minimal chance” of ruling Gauteng in 2019. He said that unlike in 2016, the DA and the EFF aren’t working towards the same agenda. The party’s ambivalence on issues of transformation and land could sideline black voters, especially as the ANC and EFF look to exploit the issues. Fikeni offered a list of challenges for the DA ahead of 2019. It must prove it provides better service delivery, but can no longer use Cape Town as its model as the city is suffering from a drought and the party is trying to get rid of its own mayor, Patricia de Lille. It’s unclear to voters who wields power in the DA, which looks as though its suffering from institutionalised factionalism. Fikeni said the party needs to be more consistent in applying its principles and move away from recognising apartheid’s impact on individuals to its impact on groups. But he denied it would have a serious effect on the elections. Silke said terminating De Lille’s membership was unlikely to influence voters in Gauteng, but it depends on what she chooses to do next. The DA campaigned on a platform of better governance in the last elections and it has had a chance to prove itself in Johannesburg and Tshwane over almost two years. “It is extremely difficult or us to get our manifesto carried out and implemented,” said Moodey. He said the municipalities were doing “exceptionally well” but struggling with the ANC’s legacy of corruption and employees who remain loyal to the ruling party. “The shortfalls are now there for everyone to see,” said the ANC’s Modiba. He said the DA wanted five years to prove itself. The DA’s motion of no confidence in Makhura will fail, and unless the party can move past its internal challenges, build more trust among voters and better communicate a clear policy on transformation and land reform, so will its goals for Gauteng. Moodey was confident despite the uphill battle ahead.